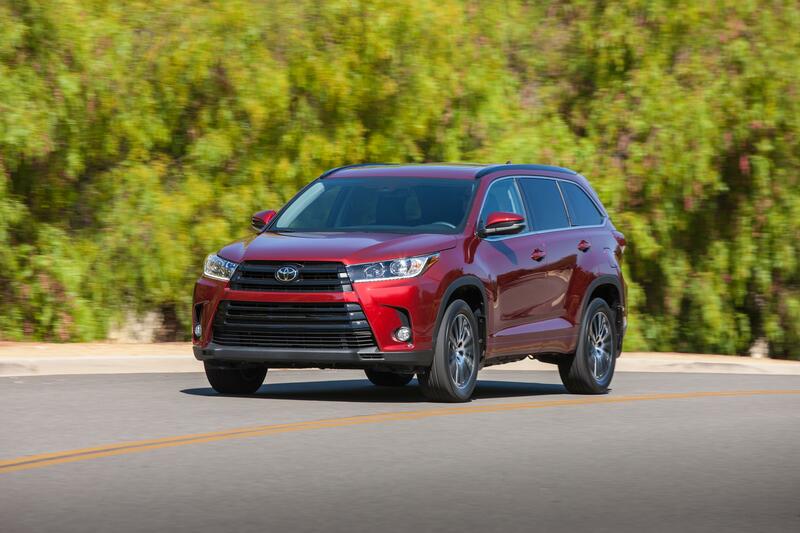 With the 2017 Toyota Highlander, you'll be equipped to take on life at your own pace. This SUV features three rows of seating, plus the ability to haul around a surprising amount of cargo. An efficient yet potent powertrain, practical features and useful technologies all combine to make this a great everyday vehicle. As the base model, the Highlander LE comes with a 2.7-liter 4-cylinder engine with dual overhead cams and 16 valves. Peak output is rated at 185 horsepower and 184 lb.-ft. of torque. The other models use the same 3.5-liter V-6 Atkinson-cycle-capable engine, which has a legendary reputation for reliability and solid performance. It uses dual overhead cams, 24 valves and variable valve timing. It puts out 295 horsepower and 263 lb.-ft. of torque, which translates into strong acceleration and freeway passing capability. The 4-cylinder engine works with a 6-speed electronically controlled automatic transmission. It comes with a sequential shift mode for when drivers want greater control, plus a snow mode. Paired to the V-6 is an 8-speed electronically controlled automatic transmission. The sequential shift mode with dynamic rev management, plus a snow mode and downhill/uphill shift management. Front-wheel drive is standard, but a dynamic torque-control all-wheel-drive system is available. You feel in command with the Highlander, thanks in part to the MacPherson strut front suspension and double-wishbone rear configuration. Electric power steering combines with a power-assisted rack-and-pinion setup. Stopping power comes via the four-wheel antilock disc brakes. Safety is addressed by passive and active systems, which work to prevent accidents and protect against injuries. Toyota Safety Sense P is included on all models, outfitting them with automatic high beams, a pre-collision system, lane departure alert with steering assist and dynamic radar cruise control. The Start Safety System is also standard, bundling together smart stop technology, brake assist, electronic brake force distribution, antilock brakes, traction control and vehicle stability control. The SUV was designed with crumple zones, side impact beams and even energy-dissipating interior trim. For even more assistance, some models can be outfitted with the Safety Connect bundle. It includes roadside assistance, automatic collision notification and emergency assistance for additional peace of mind. 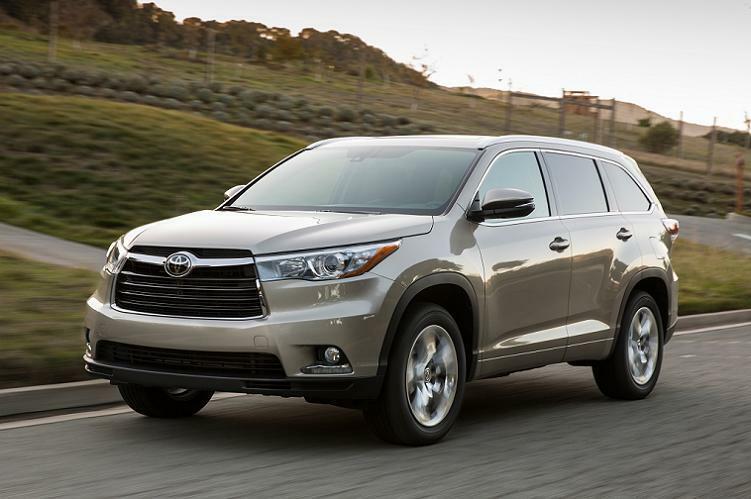 There's plenty to love about the Toyota Highlander interior, because it's designed to keep everyone comfortable. Five USB ports are scattered throughout the cabin, with three in the front and two in the rear, so people can plug in their devices and keep them charged up. Not only is there room for up to 8 people, the third-row seats can recline back. Limited models can also be equipped with heated second-row captain's chairs. Both rear rows fold flat in a flash, so you can load in larger items as needed. Thanks to comprehensive insulation installed all along the vehicle's floor, the interior stays quiet at any speed. An available panoramic sunroof lets in plenty of light, and it can tilt or slide open to allow for airflow. The optional rear seat entertainment system features a Blu-Ray disc player and a 9-inch screen, plus RCA jacks for auxiliary devices, a remote and two pairs of wireless headphones.